Hey there! I don't normally sneak in here on the weekends but I couldn't wait to share the latest from UberChic Beauty. Collection 27 and Moroccan Beauty are some gorgeous new plates. She also just released a new holographic plate holder with pages you can move around. I don't know about you but I do like having my plates organized in a certain way so this is a big selling feature. Currently you can get all of these products in a launch bundle but it's only available for a limited time. I don't know what that time limit is which is the other reason I'm posting today...to try to save any of you a bit of money in case you want them all. 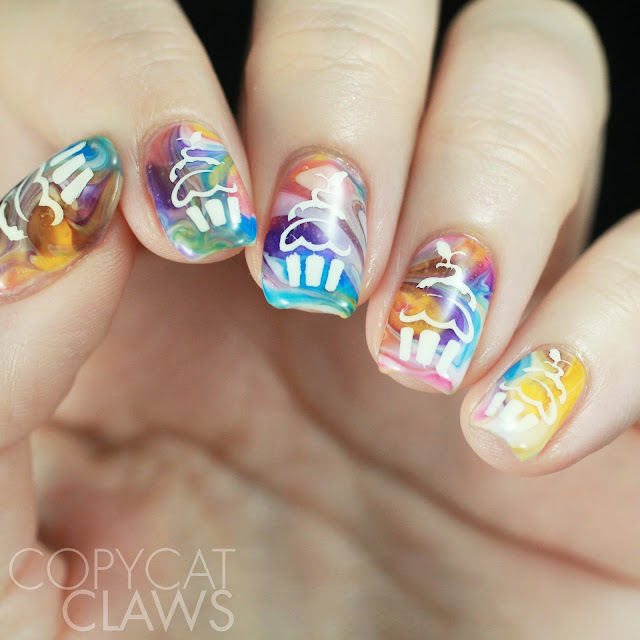 I'm also sneaking in a Digit-al Dozen birthday mani for Amy of Fancy Side Nails. She's been a bit busy being a new mommy to partake in many of our themes lately but we wish her the happiest of birthdays this month! Hey there! 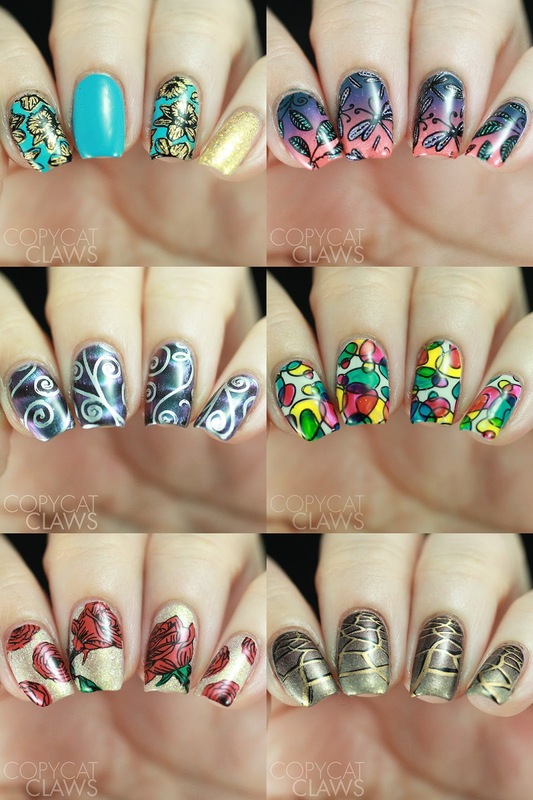 This week's Nail Crazies Unite prompt is one I've done a lot. 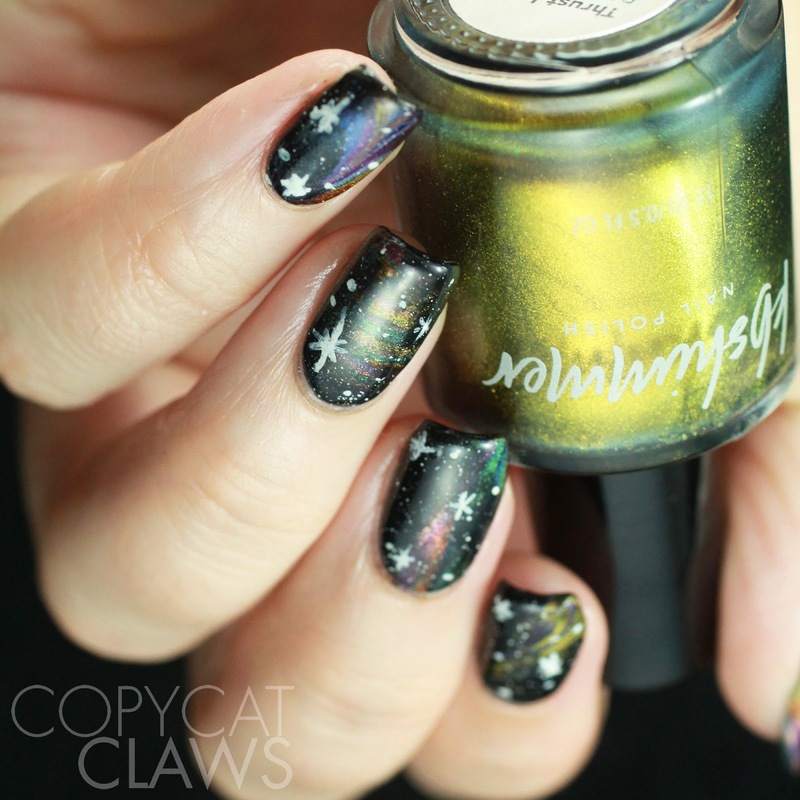 I really can't get enough of galaxy nail art but I feel like I can never come up with something new. For today I tried a drag marble with the KBShimmer Launch Party magnetics and after putting them on my nails, I thought it'd be a good base for something space-like. 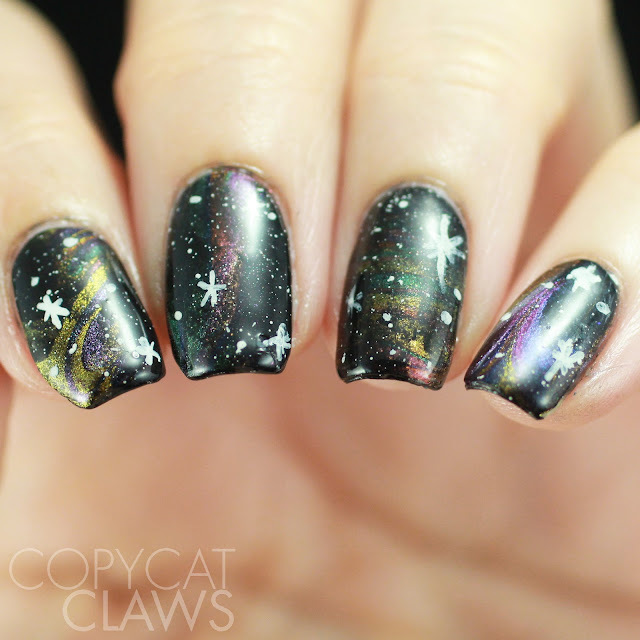 If I had to do this again, I'd use less black and leave more color but I think it's still an interesting galaxy mani. Hey there! I hope everyone has had a lovely day so far! I have to admit that my mood has been rather sour since spraining my ankle last week. It's been a swollen, black and blue mess and I'm pretty tired of the pain and the limping. 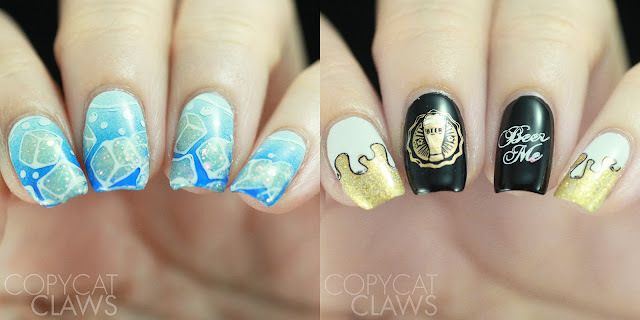 On the plus side, it's given me lots of couch time to play with some stamping plates I've been sent recently, starting with these two from Lina Nail Art Supplies. I've been a fan of this brand since she started. I use her Make Your Mark plates A LOT but today I'm branching out with a couple of the other series. 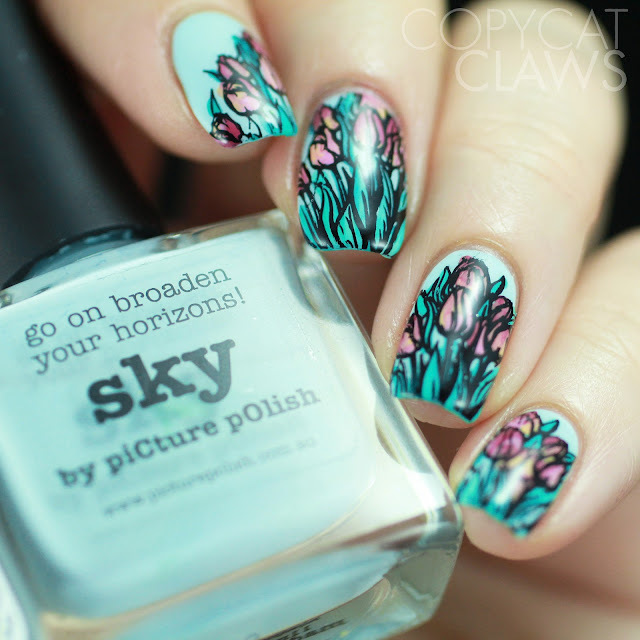 First up we'll have her 4 Seasons - Summer 03 plate and then Dress Your Nails 02. The looks of these plates are so different which tells me she has a pretty diverse imagination when coming up with her plates. In other words, she has something for everyone. Hey there! 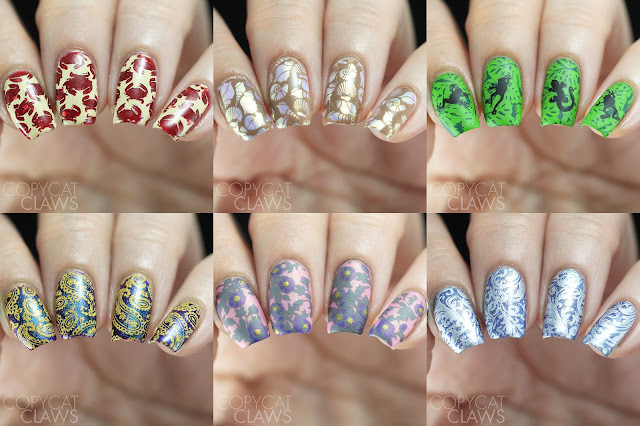 I thought I'd pop in again today to share my swatches of the recently released Harlow & Co. KBShimmer Exclusives. This is really a dream combination. 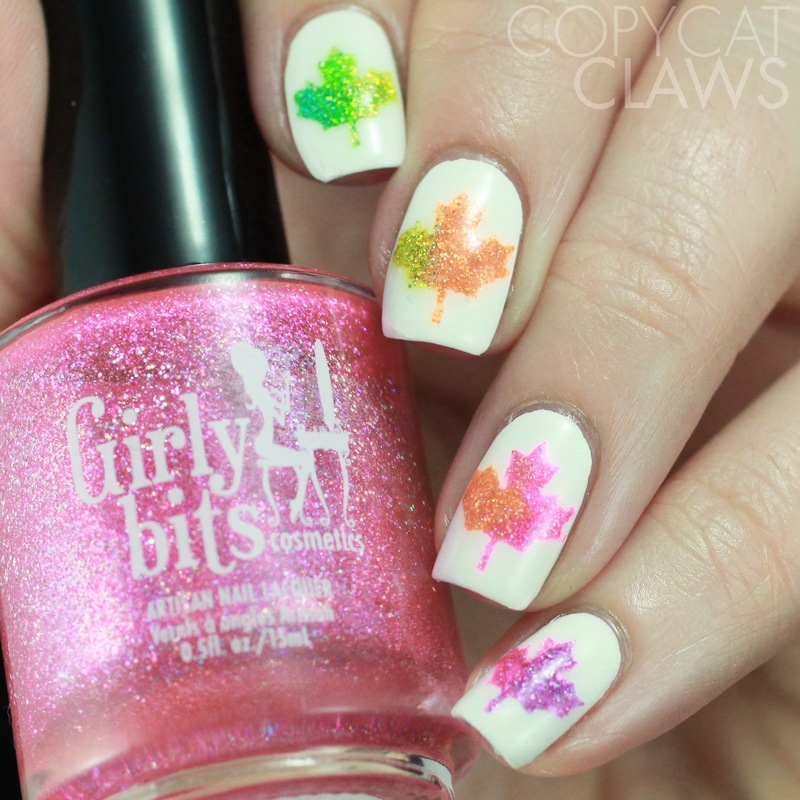 KBShimmer are easily amongst my favourite brands and Harlow is a stellar Canadian distributor (she DOES ship internationally as well). I met Katie last summer and she was as sweet as can be, just as I expected from my online interactions with her. 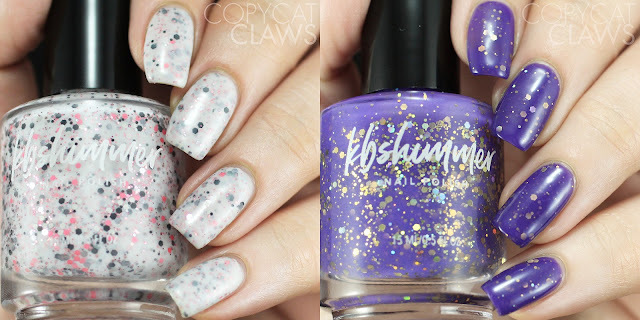 During the last restock I purchased some of the new KBShimmer summer collection and Katie included these with my order and I swatched them right away. I don't know how exclusives are designed but whoever came up with these did one heck of a job. They're really beautiful. Hey there! Today I have a prequel to the upcoming Delush Polish summer collection. 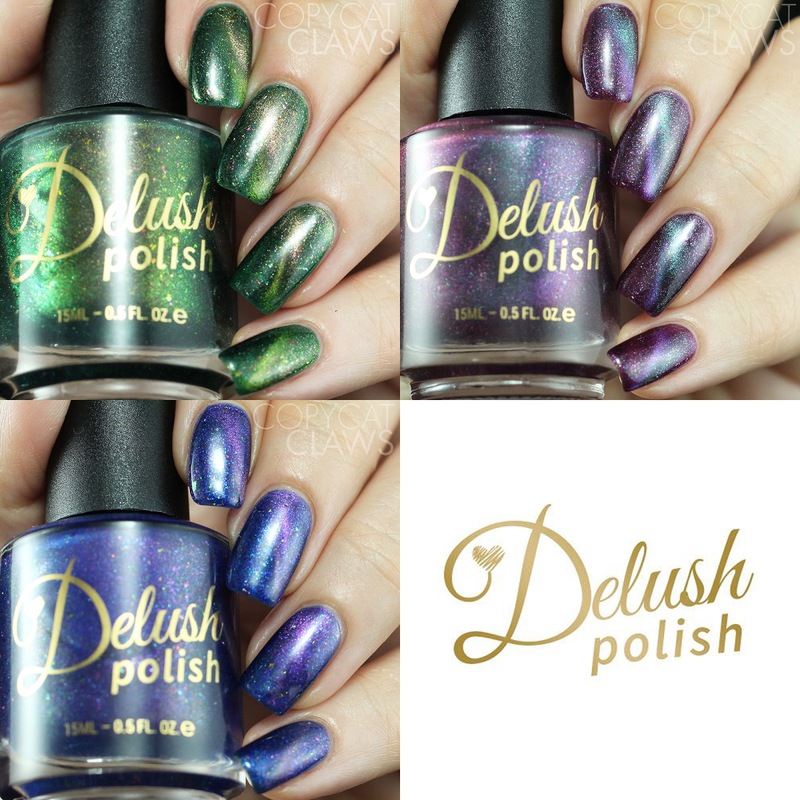 This Sunday (July 1st) will be releasing the Magnificent Trio, three magnetic polishes filled with ultrachrome chameleon flakies and gorgeous aurora shimmer. I'm all on board the magnetic polish bandwagon and these ones are really special. I don't know if it's the flakies or the shimmer or the fact that the magnetic effect was SO easy to achieve but I really love them. The application of all of them was really easy. For each I used one thin coat, let it dry a bit and then applied a thicker second coat and hovered the Delush Polish magnet (also being released this week) over it for just a few seconds. Just be sure to do the magnet part one nail at a time. 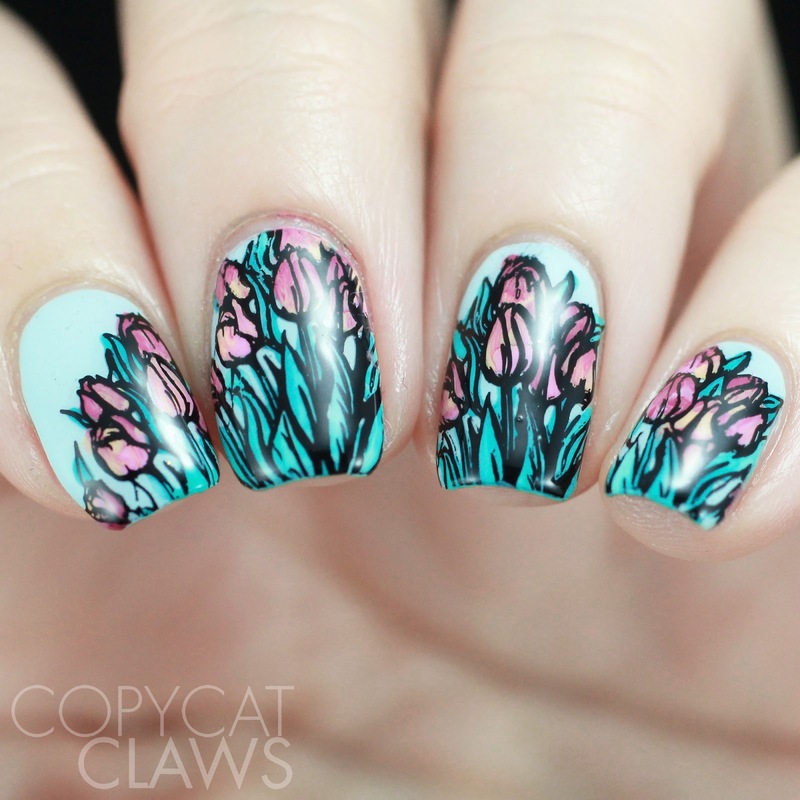 The polish does need to be wet to get the best effect. Hey there! I hope everyone is having a lovely Friday...at least slightly more lovely than mine. My old officemate (and all 'round awesome guy) is in town so I went out for a beer yesterday, missed a stair or two and ended up in the ER with a sprained ankle. How very embarrassing! And today I have an ankle that looks like it belongs on a blue-ish elephant. Luckily I had this mani done ahead of time for this week's 26 Great Nail Art Ideas prompt of Graffiti. I went with the images I immediately though of from some Lina Nail Art Supplies plates. 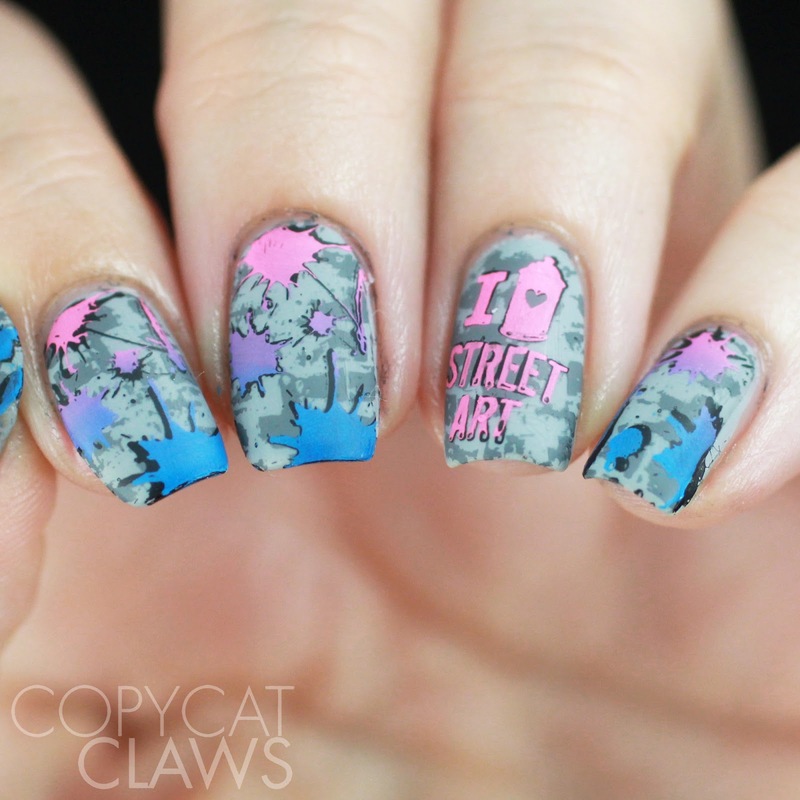 Her Make Your Mark plates are perfect for street art nails! Hey there! 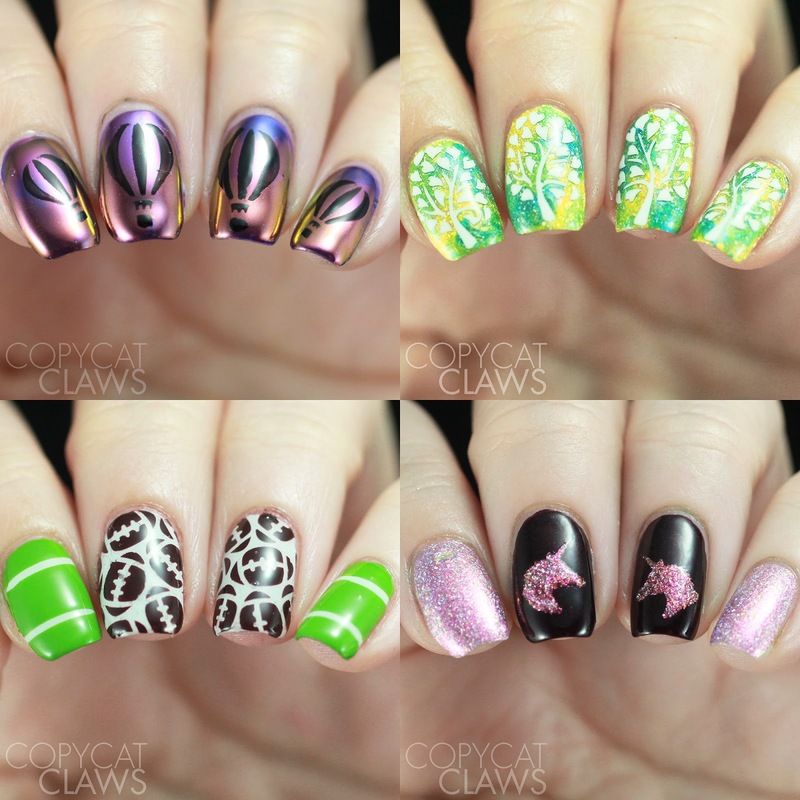 Today I have some manis I've done lately using stencils from Whats Up Nails. They sell such a wide variety of stencils patterns. The entire stencil store can be found here if you're interested. I've genuinely always enjoyed working with their stencils. Even with all the tiny little pieces in them, the quality of their cutting makes it easy to separate them and they have just the right amount of stickiness to them to allow them to stick to your nail without pulling up your base when you remove them. 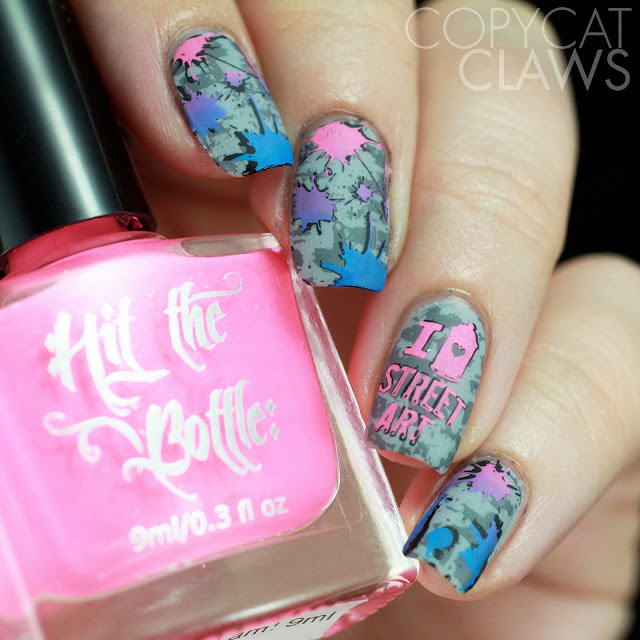 And I absolutely love that the individual stencils come in different sizes since I don't have big nail beds. Here I used the Hot Air Balloon Stencils, the Tree of Love Stencils, American Football Stencils and the Unicorn Head Stencils. Keep reading to see what products I paired them up with. Hey there! Oh my, I'm so late with this review so I apologize. I quite literally always begin playing with the new UberChic Beauty plates the second I receive them...and I did with these too. I've just been blog-lazy. But better late than never, today I have the UberChic Beauty Collection 26 to share with you. As with all of her plates, this is a set of 3 with really pretty designs that stamp perfectly. This collection has a lot of images that play with perspective, a few layering-style images (which are always fun to play with) and lots of positive/negative space. Hopefully I did it justice with the 6 manis I've done with it! Hey there! 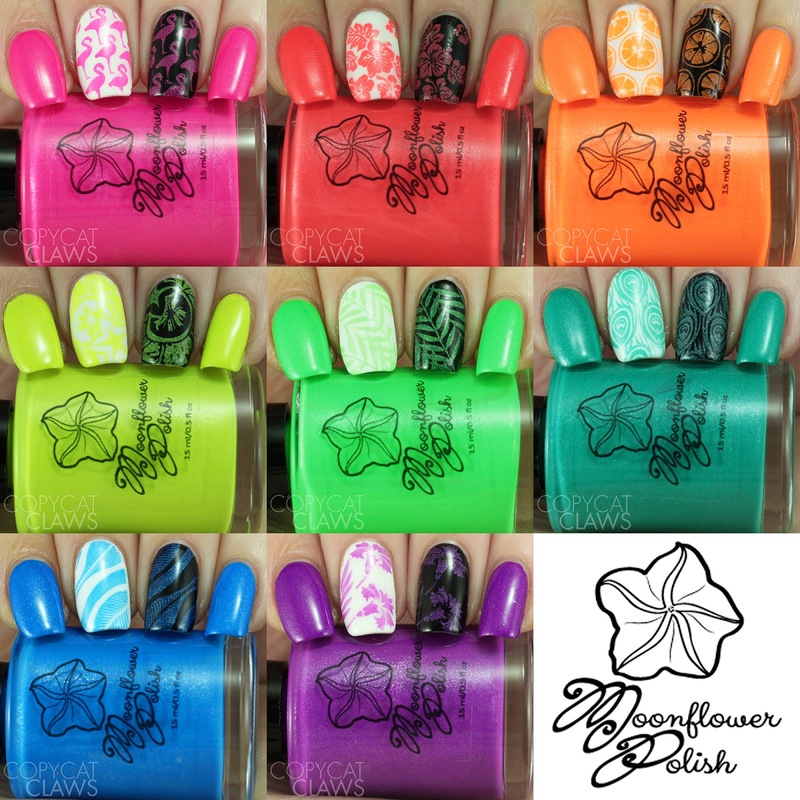 On my blog today I have a review of the entire summer 2018 collection from Moonflower Polish. 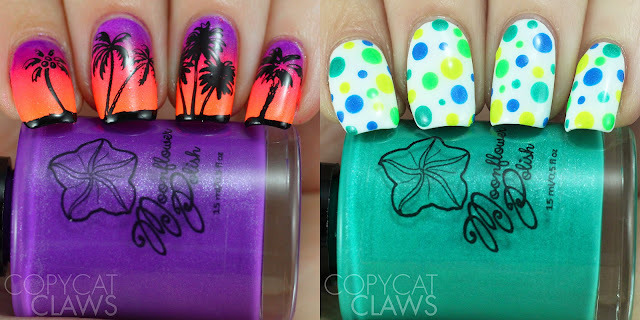 The Summer Neons are super bright stamping polish with added shimmer. 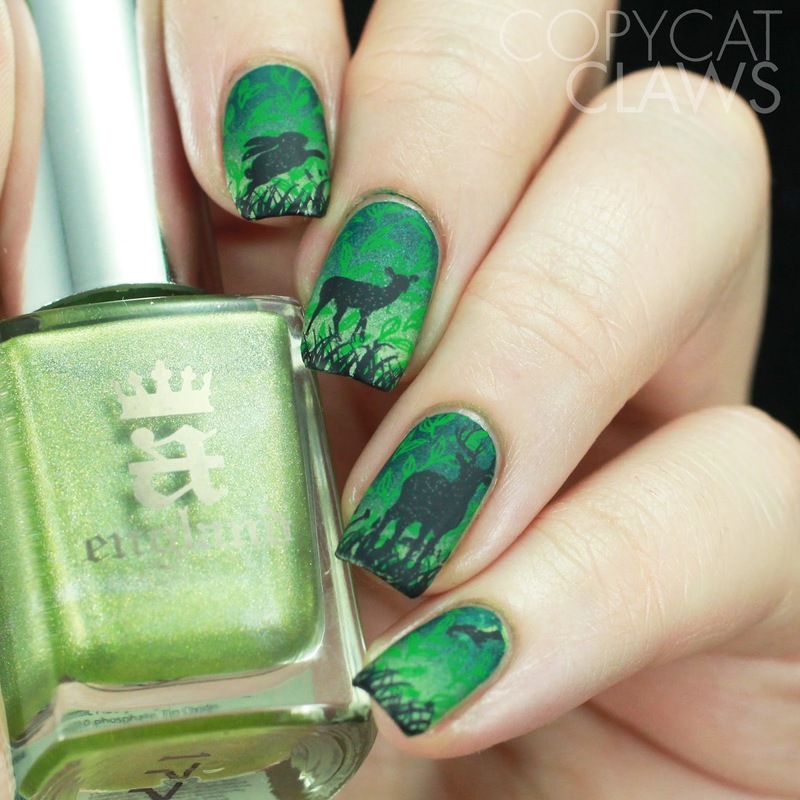 The shimmer helps their opacity when stamped over dark colors without making them too thick. I stamped them all over white and black and swatched two coats on my other nails. 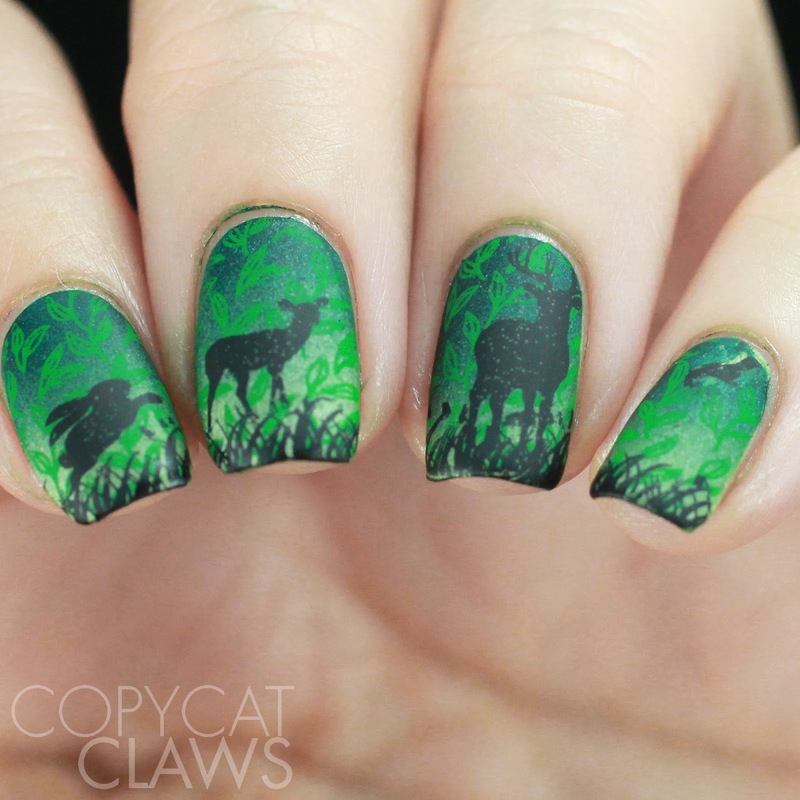 I was really impressed with their stamping (I didn’t need a sticky base) and their application on their own. 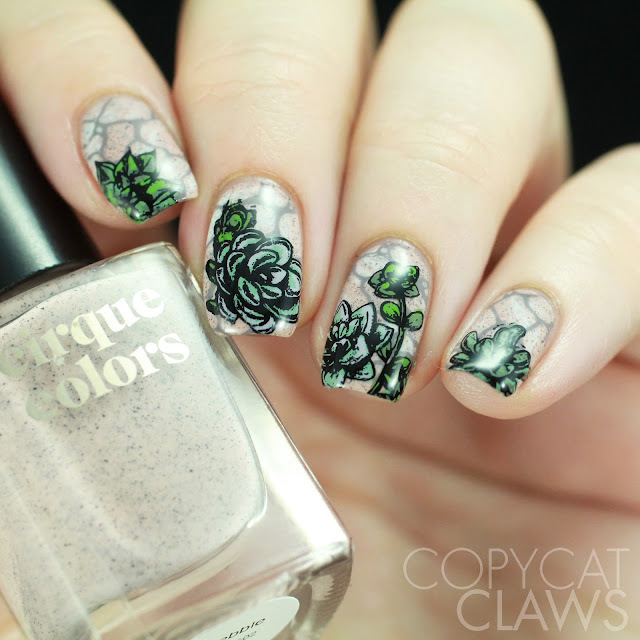 And, since I am such a big fan of using Moonflower Polish in nail art other than just as the stamping polish, I couldn't resist doing an extra couple of manis with them. And I'm happy to say that the sunset mani lasted me from Wednesday to Saturday last week (practically a lifetime to me) and only showed tip wear. The neons didn't chip one bit. Hey there! For today's post I managed to combine the Digit-al Dozen's In My Garden week with today's Nail Crazies Unite theme of Lisa Frank-Inspired. 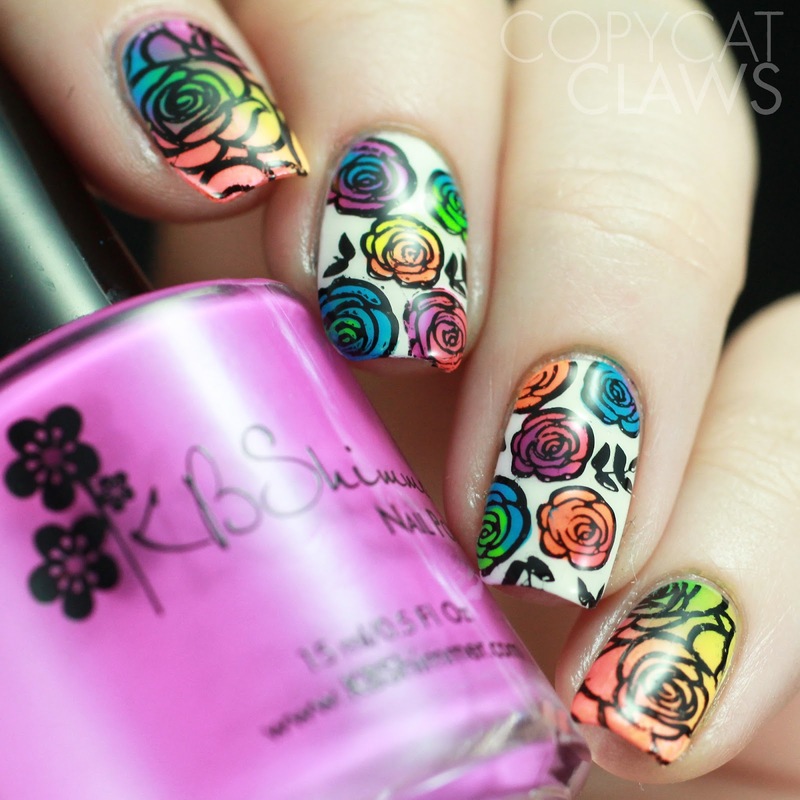 I know rainbow roses like this don't grow naturally but wouldn't it be cool if they did?! 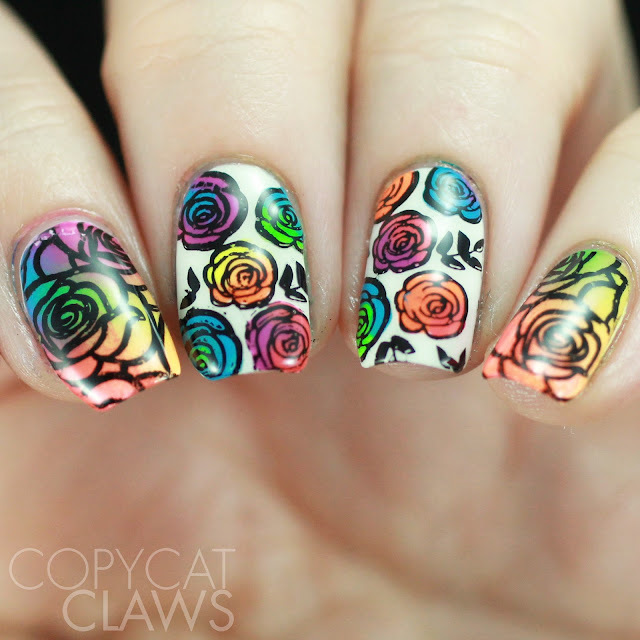 I'm actually a bit too old to really know what Lisa Frank did but I do she did a lot of neat neon stuff so I did some neon roses with the dreams that someday there will be a neon rose garden. Hey there! Since I don't actually have a garden, it was a bit challenging to come out with "In My Garden" ideas. But I had just bought Cirque Colors Pebbles and thought it would make a good rock garden. However, when I googled "rock gardens" I learned that they're not literally just piles of rocks. There's usually lots of succulent plants in there as well...who knew?! 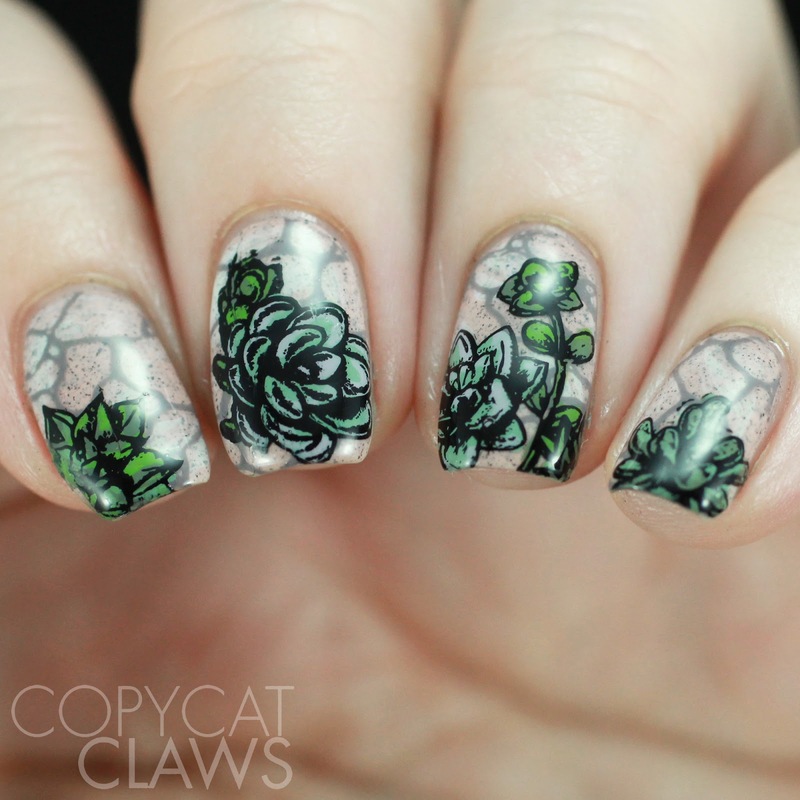 Luckily succulents are very popular these days so I had a stamping plate that was just perfect for it and I came up with my favourite mani of the week. I hope you like it too! Hey there! My third Digit-al Dozen In My Garden post will be a quick one. When I was trying to think of ideas for Garden week, I asked my mom what pests were in her garden. Her response: "deer, rabbits...and your dad". Good one, Mom! 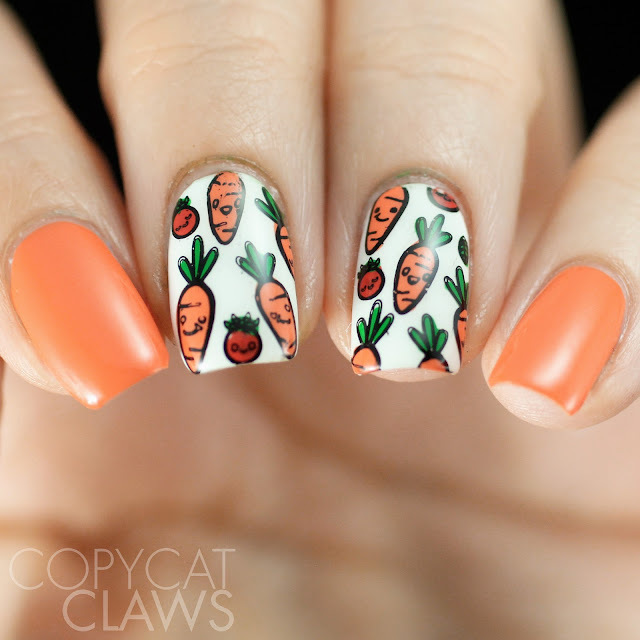 So that was the inspiration for today's mani - the critters that steal my mom's veggies! Hey there! I have such a fun post today! Nail Polish Canada (the first online nail polish stockist I ever discovered and still one of my faves) has decided to celebrate the upcoming Canada Day by giving away a set of these Whats Up Nails Canadian Flag stencils to 10 of my readers. The first ten people to follow this link to the NPC site and use the code BC5H85E1S will get their very own set for free. And, if you've read any of my previous reviews of Whats Up Nails stencils you'll know that these stencils are always incredible. 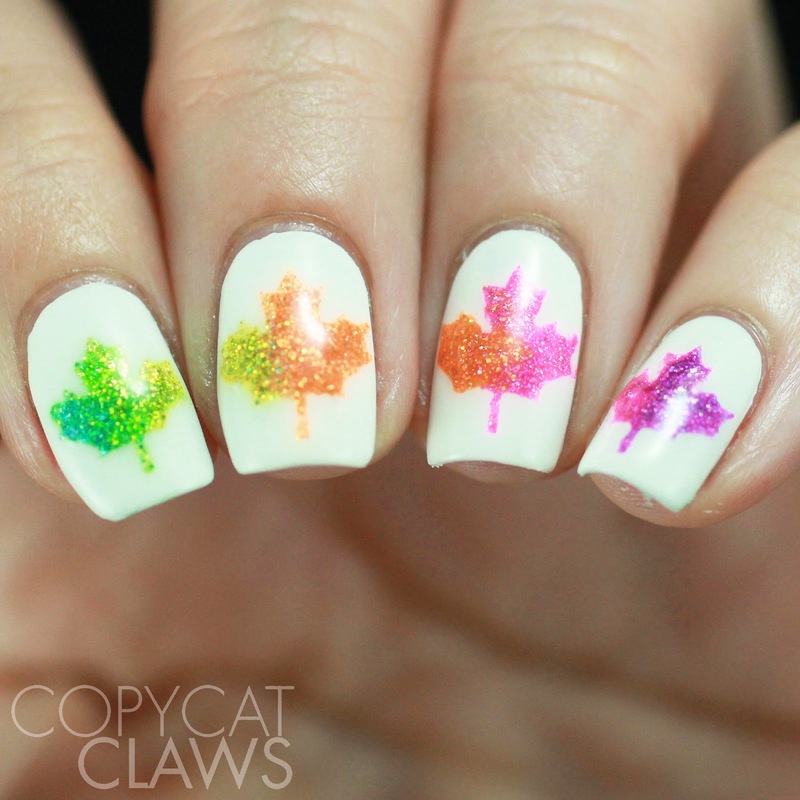 You'd probably expect a red and white mani with these (and I have indeed used these stencils before with just that) but since Canada is more than red or white, I decided to use the entire rainbow of colors since that is what Canada is to me. We won't be kept to use two colors...we need them all! Hey there! It's the second day of The Digit-al Dozen's In My Garden week and I'm again drawing inspiration from my mom's garden. For as long as I remember, my mom has planted tulip bulbs in the fall. Sometimes just a few, sometimes lots. But around our yard they were always the first sign of spring which probably explains why they're one of my favourite flowers. Hey there! It's the middle of Friday night and the first time I've had time to actually blog. But I couldn't not post his week's 26 Great Nail Art Ideas mani. The prompt was dry/drag marble. 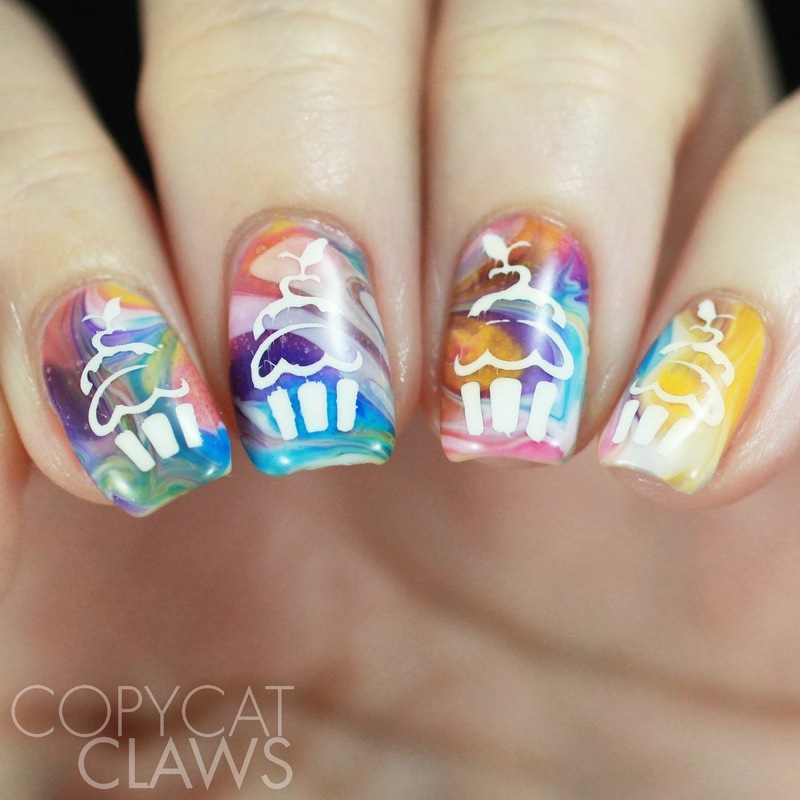 I think it turned out pretty cute...but then to make it even cuter I put some Whats Up Nails Cupcake Stencils on. Hey there! 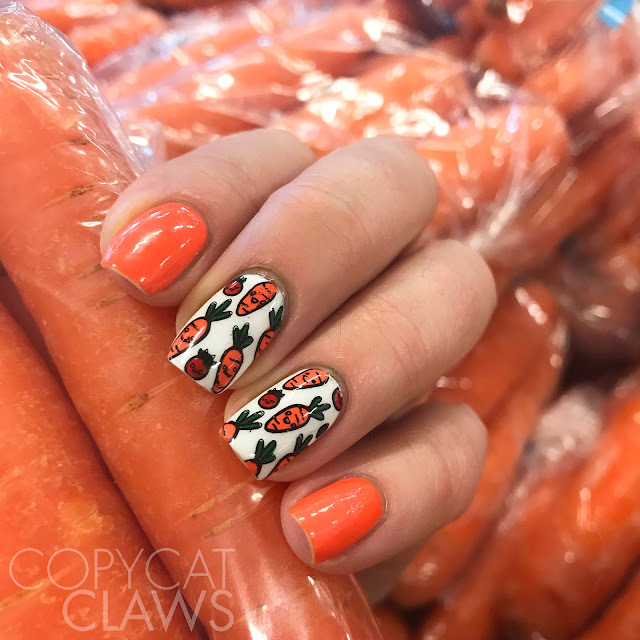 I'm not sure everyone has heard of My Mani Box, the nail art subscription box dreamed up by the geniuses at Beautometry. Each month contains 2 MoYou London stamping plates (you can pick regular or XL image sizes), stamping accessories and more nail art goodies. Every month is different...how fun! 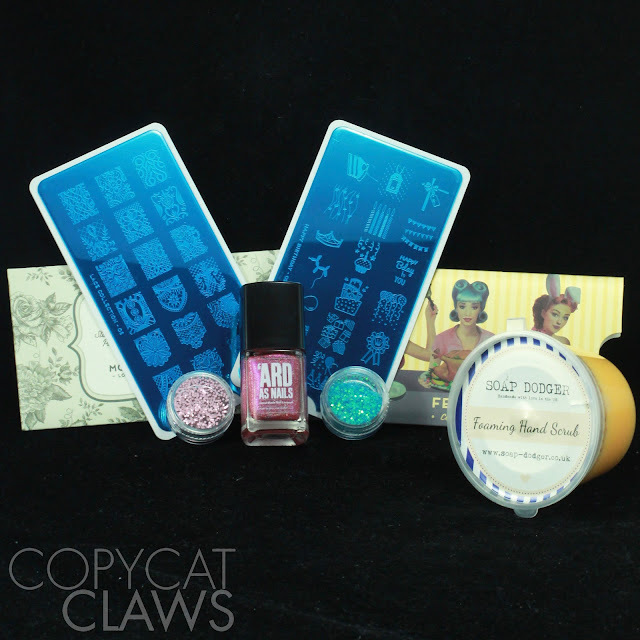 I believe the box I received for review was April's box which, in addition to the plates, contained a full size indie polish, a hand scrub and two jars of square loose glitter. Since April is long gone, if you were to order now, this wouldn't be the box you receive but yours might be even cooler. The really nice thing about this box is that you don't need to subscribe for any set amount of time. If you just want to try it out, you can purchase a single month. But multiple month subscriptions are also available for a reduced price. It's up to you! Hey there! Hope everyone is having a great weekend! I spent my day sleeping in and then out for farmer's market shopping and a really nice lunch. It's been a great Saturday! 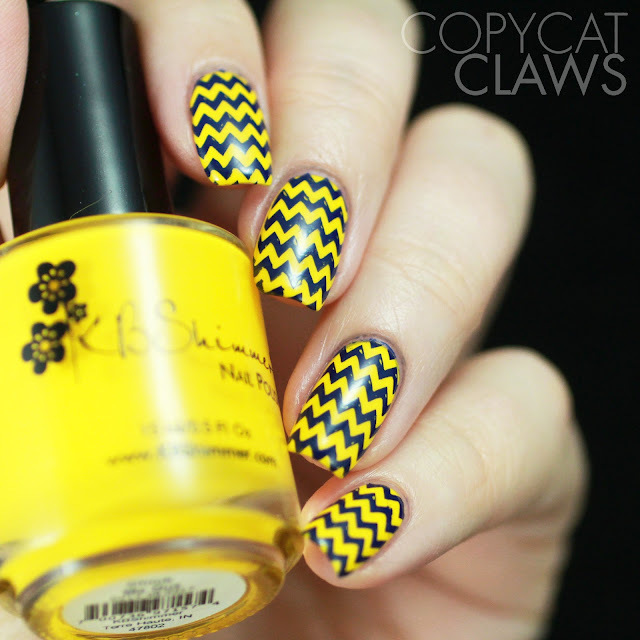 Now I'm laying on the couch writing up a little blog post for this week's Nail Crazies Unite prompt. This week our theme was "Inspired by a TV show". I LOVE TV...but I never know how to translate it onto my nails. 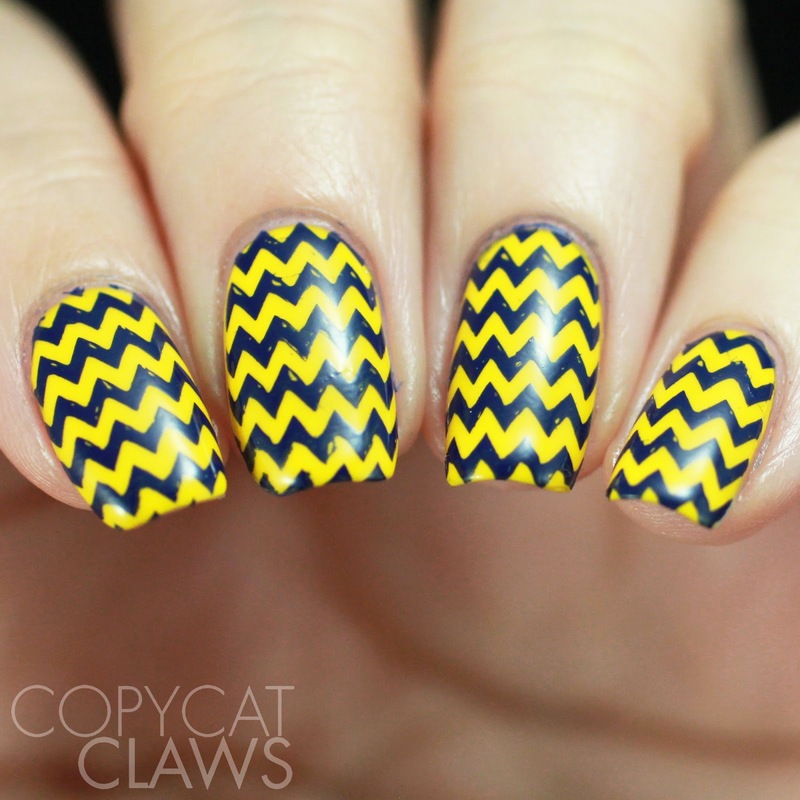 But I remembered this scene from one of my favourite shows, The Good Place, with these wild yellow/blue chevron clothes and this seemed like a great time to put that on with some simple stamping. Hey there! It always makes me happy with UberChic Beauty releases new products. 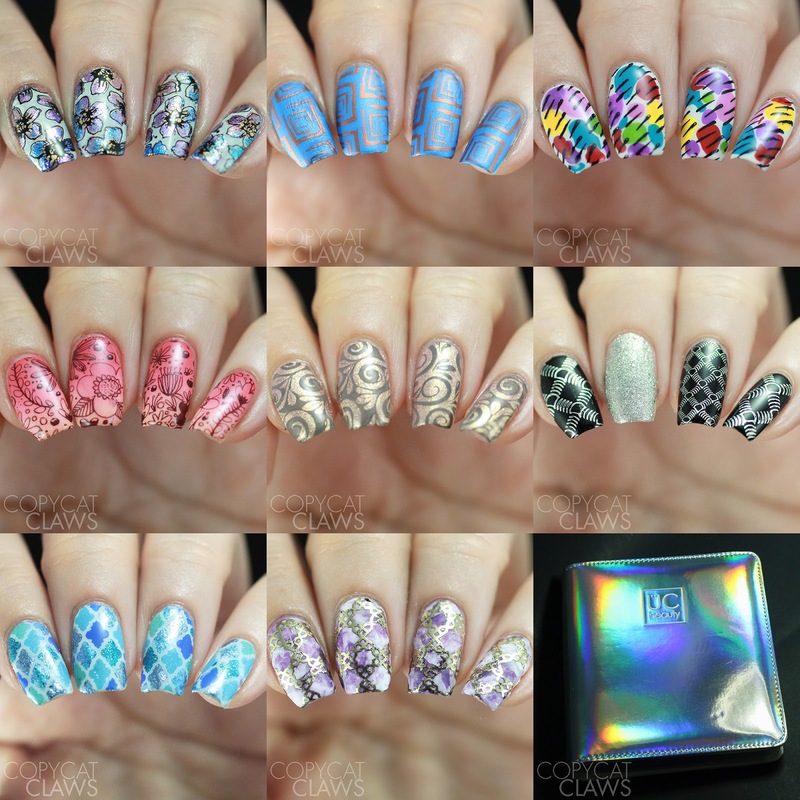 She recently came out with a Bottoms Up stamping plate with all kinds of drink images and a new polish barrier called Edge Perfection, that I have used for every mani I've done since receiving it. I got way too excited when I saw the Bottoms Up plate which tells me I might need to re-evaluate my love of beer. But it's not just beer on this plate. It has coffee, wine, tropical drinks and more. We all need to consume liquid to survive so we might as well wear it on our nails too, right?